Rachel takes her 2nd World Cup win in 7 days - her first ever win at Leogang! Gee narrowly misses podium in 6th place while Taylor finishes 33rd. 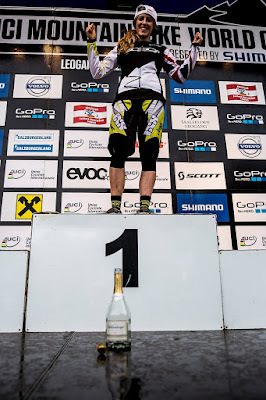 In both the men's and women's race in Leogang, the wind was definitely a factor, especially on top of the course. Riders enjoyed the track during qualifying - in particular the more natural sections that have been cut in for this year - but as the track was ridden during the race it seemed to change under them! The women raced first. Emmeline Siegenthaler was in the hotseat when 7th qualifier Manon Carpenter crossed the line about 0.5 seconds ahead of her, but in a dramatic turn of events Manon was disqualified when she went off course on landing and broke the tapes close to the finish (she would have otherwise been placed 4th). Tracey Hannah, 4th qualifier, crossed the line in 3rd (not enough to podium) then 3rd qualifier Tahnee Seagrave was on course. She rode a smart race carrying good speed down the course to take the hotseat by a massive 7 seconds, despite a mistake in the bottom section. 2nd qualifier Emmeline Ragot was just 0.15 seconds behind Tahnee, so all eyes were on Rachel. Rachel was very fast through the top section; she lost some time through some holes but strong pedalling put her 2 seconds up by the first split. There were tense faces in the GT Factory Racing team as Rachel made a mistake in the woods, but she held it and carried good speed through the remains of the technical section, gaining at least a second with a straight line through the rock garden. 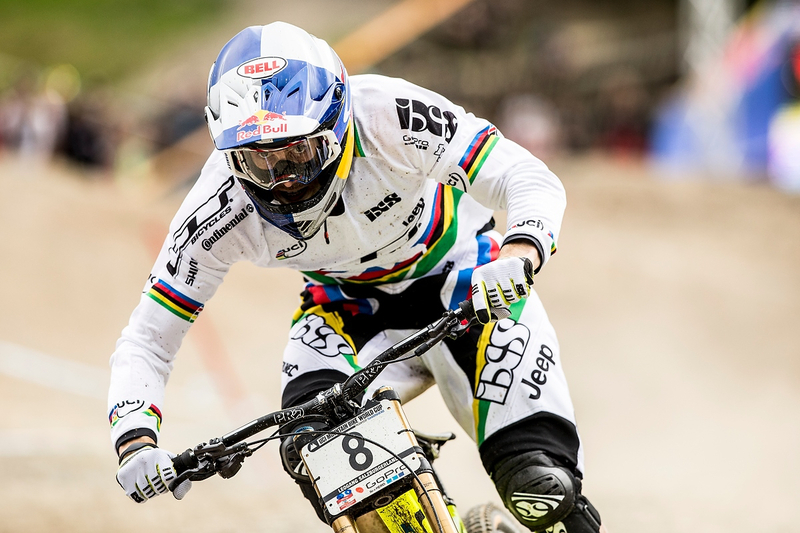 She crossed the line 3 clear seconds ahead of Tahnee to take her first ever Leogang win. Rachel said: "It started to rain about 10 minutes before my run but it wasn't too bad; i nearly crashed before split 1 but I held it and then tried to relax and push on the pedals once it was safe. It's a fairly wild track now it's so dry! 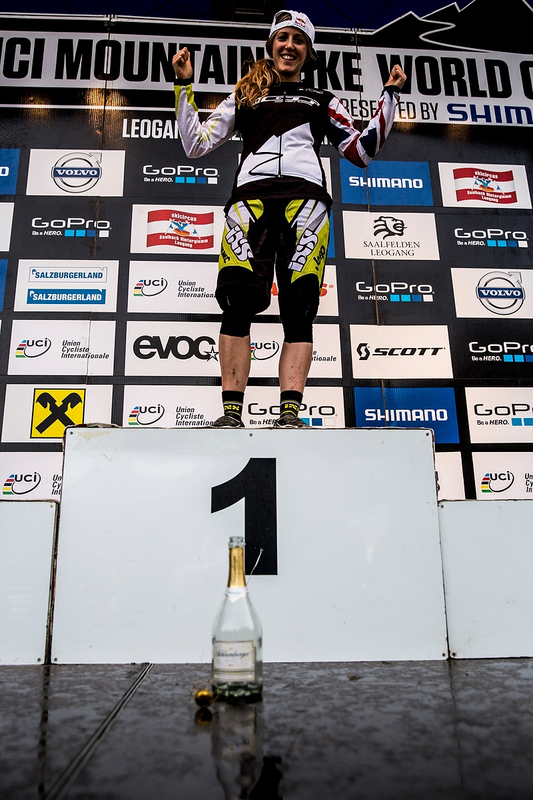 Pretty cool that i finally won in Leogang!" In the Men's race Loic Bruni had crashed in qualifying, ending up in 66th place. He took the hotseat early and held it through more than 50 riders - though he said himself he hadn't done enough to take the victory (he finished 8th). Taylor Vernon had qualified in 50th but today was not his best run and he made a few mistakes on the drying track, enough for a final 33rd. 8th place qualifier Troy Brosnan was in the hotseat when Gee came on course with Greg Minaar in second by 0.3. Gee was less that 0.3 down at split 1 and looked to be carrying good speed through the technical sections but he crossed the line in 3rd, which was only enough for 6th on the day. There was much excitement still to come. 3rd qualifier Remi Thirion went into the hotseat by 0.2, then next man down Connor Fearon took the hotseat from him by 1.2 seconds - a huge margin for this course. Fearon had crossed the tape (but not the poles) so his time was safe. Last man down Aaron Gwin snapped his chain as he left the start gate but in a demonstration run he maintained his momentum to take the win by 0.045 seconds. Gee said: "Sixth place today is pretty frustrating after some good speed this weekend, but to be fair my run was scruffy, I made a mistake up top and huge respect to Aaron Gwin for that run with no chain!" Taylor said: "I was too cautious and a bit messy up top today. I got into it by the bottom but i wanted more."